On September 17, 2009, Professor Dr. Brinsley Samaroo, under the patronage of the University of Trinidad and Tobago (UTT), held a lecture titled, “Recovering Tangible Heritage” at the National Library and Information System Authority (NALIS). This lecture was meant to be an eye-opener to students of history as well as Trinidadians and Tobagonians in general, who may not be aware of the significance of some recent historical sites. The aim, in addition to general edification, is the preservation of these sites for further excavation and exploration for generations to come. Dr. Hollis Liverpool, Calypsonian and Historian chairs the proceedings and provides further details about the lecture. Our main objective is a research institute for advanced study and research for critical thinking etc. and we have, over the years, been presenting these lectures. And these Senior Research Fellows have been doing research and giving us insights into the research. We have Professor Selwyn Ryan, we have Mr. Lawrence Scott etc., etc. and you have been coming from time to time. So welcome and thank you very, very much for coming out. And this evening we have Professor Dr. Brinsley Samaroo, a name that is well-known in Trinidad and Tobago for history. This lecture tonight will be based on recent historic sites in Trinidad and Tobago, “Recovering Tangible Heritage.” Just to give you an insight into the lecture, a major part of the process of national self-definition is the location, description and exposure to public gaze of physical structures which have shaped the nation’s development and we have all these physical structures all over the place in Trinidad and Tobago. But the significance was missing. Many of us have not been exposed to the significance of these sites and the significance of these artifacts should not be undervalued. They are important reminders of plantation slavery and pointers to the creativity of our ancestors as they sought to reinvent themselves in the New World. In many instances, these artifacts represent the joint actions of peoples of different ancestries as they adapted to changing circumstances of their lives. These physical reminders of the past can be seen in the middens created by the first peoples and in the more substantial structures built by African and Asian labourers. There are also twentieth century structures erected during the First and Second World Wars. Many times, we pass these sites and many of us in Trinidad and Tobago, we discard them. It is a fact that many of us don’t see them as historically significant and it is a good thing we have people like Mr. Samaroo to remind us of our sites that we have in Trinidad and Tobago. So this lecture tonight will examine, only a few we can examine, of the many prehistoric sites in Trinidad. Pre-Colombian locations have been the subject of considerable research and this lecture’s emphasis will include nineteenth century sites such as the Five Islands off Trinidad’s North West peninsula, the African American, Islamic and Baptists settlement at Hondo River in the Valencia forest, the cemetery managed by the slave-seller Louis Bicaisse at Rambert Village, part of the La Mont estate just outside of San Fernando, the temple in the sea at Waterloo Bay and the sugar remnants of Brechin Castle in Caroni. Professor Samaroo is examining these sites for us tonight and see how significant they are. For those of you who don’t know him, Mr. Brinsley Samaroo has been one of our icon historians in Trinidad and Tobago obtaining his Bachelor of Arts and his M.A. in History from Delhi University and his Ph.D. from the University of London. Students from the University of the West Indies (U.W.I. 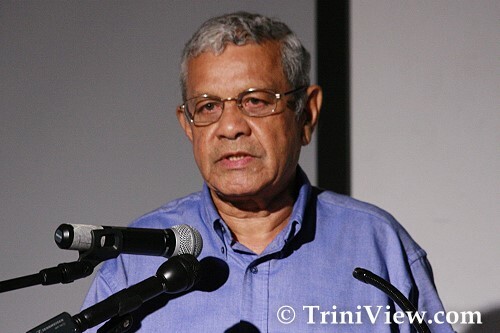 ), including myself, have passed under the hand of Brinsley Samaroo and he has published extensively on the history of Trinidad and Tobago with a specialty in working class movements, Indo-Caribbean history and political and institutional development. Between 1987 and 1991 he was a Minister of Government, he served as Head of the History department at the University of the West Indies (U.W.I.) St. Augustine and he has worked on numerous university committees. At present, he is a Senior Research Fellow at the Academy of the University of Trinidad and Tobago (U.T.T.) for Arts, Letters, Culture and Public Affairs. A few days ago, I was telling some of my students that whereas the sociologist looks at our way of life and anthropologist looks at our way of life etc., the historian looks at our development over the years. So as Professor Samaroo gives his lecture, think of our development over the years, of how these sites have helped to develop the people of Trinidad and Tobago; our own human development. So I bring to the microphone, Professor Brinsley Samaroo.